In this post I will cover an aspect of the ePatient and the clinical setting of an appointment with a medical provider. One of my previous providers restricted their patients to a single chief complaint, perhaps to keep sessions short and focus on the most critical issues. This always struck me as an essentially misguided approach – how was the patient to know what was the most serious complaint, and how would one ever have a meaningful relationship if only one thing was dealt with? I often wondered how satisfied the average patient was with this method, and how many left with serious and unaddressed issues. The freckle that bleeds on occasion might never get discussed, while the current sniffles or itchy eyes might easily take up that one slot. By the time the freckle was a big sore and the cancer had spread through the body, it would be long past the right time to have seen to early prevention. From the patient side, the clinical setting is mostly a foreign and somewhat scary terrain, and maximizing the value of visiting a doctor faces serious challenges. These challenges include an asymmetrical power and risk balance between provider and patient, a knowledge asymmetry, and emotional hurdles. In most people’s experience, a doctor is a somewhat intimidating figure, one that has all kinds of social trappings of power. In that sort of situation, patients (especially those from large power-distance cultures) may tend to have a hard time explaining their concerns, articulating clear symptoms and signs, or pushing back if the doctor gets it wrong or the treatment isn’t working well. In most cases, the patient is decidedly the inferior in terms of power and authority. The provider is also on the high end of the knowledge balance, and typically the only patients to rival a doctor in terms of knowledge of the condition, are those chronic patients who have earned their knowledge through time, pain, and intimate experience. In that situation, it is hard for the patient to have decent questions to ask, or have the gumption to ask them. Lastly, there is emotion. As the behavioral economists like Tversky & Kahneman, Ariely, and Gneezy, have demonstrated in many experiments, clear thinking and intellectual performance tend to be rapidly eroded and compromised when emotions ratchet up – and what is better at winding up our emotions than fear, pain, and the threat of illness or nasty (or embarrassing) tests? The tide is certainly against being able to clearly articulate specific concerns, symptoms, and questions, and we haven’t even covered how actually being feverish or having a headache or being nauseous can mess up the ability to execute an effective clinical visit. So clearly having some help in coming up with good questions and planning the visit would benefit most patients. Even if you are under the weather, in pain, or about to launch your stomach contents into a bucket, having some time before the visit to think over what has been going on with you and writing the main points and questions down is likely to increase the likelihood of remembering them when asked. So the first step is writing stuff down, and for this a pencil and paper are pretty adequate. The only downside is that you will have to remember to take it with you, use it, and then afterwards to file it somewhere with all the other medical records that you keep. Of course this raises a host of issues – what if you lose them, what if you misfile them, and even worse (probably), what if somebody else finds them – perhaps a somebody that would be very embarrassing for you? The next challenge is, of course, capturing the answers. Most providers will not object to a patient fishing out their notebook and asking pertinent questions, or listing signs and symptoms related to their condition, and will gladly speak to them and let them take notes. Unfortunately, unless one is adept at shorthand and is remarkably cool-headed, most of what the provider says will be lost, and of that which one does catch, much will be forgotten within hours. A sad fact with regard to memory is that even under ideal conditions, recall fades fast. Up to 80% will be gone within days, and of the remaining 20%, some will be corrupted. Some things will be accentuated, some will be diminished, and some will be mixed with other memories. This is where the app comes in. While I may easily forget to bring along a notepad and pencil, I am seldom if ever without my smartphone! With a secure app, notes can be stored safe from other eyes, and are already electronic so can be stored in a central repository. As I described in the last blog on my ePatient experiment, I have selected Microsoft HealthVault as my Private Health Record (PHR), so I looked for a planning app that integrates with HealthVault. This reduced the number of apps that I could use, since a major criterion was to have integration, rather than best of breed and then sit with fantastic components but no functioning solution. 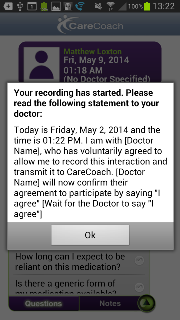 Of the several apps I looked at, I selected CareCoach for the experiment, and after a few small hurdles in getting it to integrate with HealthVault, I was ready to try. I found the process of linking to HealthVault a bit counterintuitive, and needed to contact the (very helpful) support team at CareCoach. 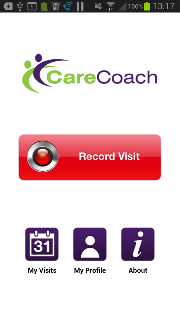 What was not clear to me was that one needs to have both the app and use the CareCoach website. I personally think this is the wrong solution over the long haul, and they should expand the app functionality so that the website isn’t needed. Web portals and websites are so last decade anyway. It didn’t take much to get connected from there on, and the functionality was fairly easy sailing once it connected. The app seamlessly integrates with their website, so appointments made on the app or recordings made with the app show up on the website without any user involvement. CareCoach doesn’t however integrate with a provider directory, so providers have to be manually captured in order to start the planning process. This is a weakness in my view, since provider registries are available, and like the research apps (WebMD, MedScape, Epocrates, etc.) it should be possible to search and select. In the longer term, the app needs to integrate with the research apps and the insurer apps in order to provide a seamless experience. Bottom line – don’t ask the human to capture stuff that is already encoded electronically. Once the provider details were captured, the specialty could be selected. 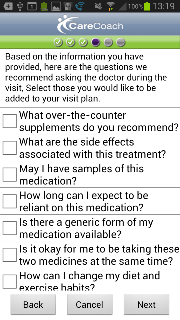 To set up the appointment there are a number of options, and if a condition is selected, the app generates a list of likely questions based on previous patient’s experiences. According to CareCoach, this amounts to some 70,000+ live doctor-patient interactions. One can tick off which questions are relevant or desired, and these are added to the planning list. One can also add additional free-text questions. My next scheduled visit was with my optician, and so I set about registering them in the app, selecting the type of visit, and thinking through what I wanted to ask them. Few of the suggested questions seemed relevant to my visit, so I manually set out a number of questions that I thought were pertinent. This puzzled me a bit, since some of the suggested questions wouldn’t make sense given the clinical specialty I had selected – why for instance would prostate questions be relevant to a visit to an ophthalmologist? Just to make sure that I hadn’t entered something wrong, I went back and added a dummy provider, selected ophthalmology as a specialty, and sure enough there were questions about prostates, urinary tract problems, etc. So perhaps something in the selection logic needs tweaking. However, entering my own questions was easy and I had no other issues. I didn’t do this effectively of course, because after I had started the session I realized that my notes were supposed to be for any symptoms or information relevant to giving the doctor a clear clinical picture. My medical notes are supposed to be discussed with the provider – So the milk note was pretty useless, but since the visit was a routine follow-up for field test it didn’t do any harm. My questions were things I knew I would forget to ask, and I would have forgotten but for them being listed in the appointment. Since I am over 45, it is important to start thinking about whether my sunnies are actually protecting me, and how long I can expect to go without needing attention for cataracts. (Living at high altitudes is a big risk factor for cataract). The doctor was surprised by my request, but open to having me record her and was very curious about what I was doing and how this could improve my care. Since the practice does not (yet?) have an EHR, this was perhaps a good “worst case scenario” and shows that even if the practice isn’t equipped to integrate with an ePatient and doesn’t even have an EHR, they might still be able to participate in what the ePatient does, and to form part of a care team to a degree. This is good news for the ePatient because it frees them from depending on the provider being high on the adoption curve, and gives the ePatient a way to build their own path if the provider simply isn’t technologically ready. It only occurred to me afterwards that the retinal scan image (paper), my field test (paper), and the eye exam (hand-written notes) could have still have been captured. I could have simply photographed them and uploaded the images to my PHR. Low resolution is better than nothing at all, so perhaps I should add that in my notes next time so I don’t forget. Unfortunately, the app doesn’t let one backtrack and restart the prompt, which may prove to be a problem if the provider asks for it to be read again, (or one blows right past it like I did). Having the app lent a bit of a theatrical air which actually helped, and I found it easy to hit record, read off the questions, capture the answer, and move to the next question. After I left, forgot to pick up the milk, and arrived home, I was frankly expecting the recording to be a complete failure. After all this is a tiny microphone in a handset and designed for the mouth to be within millimeters, so how good was it going to be at picking up somebody across a table? However, holding it flat on my hand between us worked just fine, and I was amazed at how clear the recording actually was. The app then offered me the alternative of typing out my own notes from the recording, or uploading to a transcription service. Since CareCoach has an introductory freebie going, I sent it in for free transcription. This might give many people pause, and they might worry that sending recordings off to a third party to be transcribed is risky. However, although it does add risk, this is very much the same as what the providers have been doing for years. Many of them, especially in hospitals or large practices, will dictate their hand-written notes and a transcription service turns that into text and sends it back to them. So this isn’t anything new, it just wasn’t something patients typically did in the past. So how did this work out? As a test, I didn’t listen to the recording other than to verify that it worked, and I then jotted down a few notes on what I remembered the doctor saying – my sunnies were good, it would be a long time before I would need to think about cataracts, and something about glaucoma. Now that I look at the transcript, I can laugh about just how right those psychology courses were about the rapid decay of memory. What I recalled was less than 20% of what she actually said, and while I recognize most of it when I read it, there are some parts I don’t remember at all, and some that I remembered wrong. Her evaluation of my sunnies was also a fair bit more qualified than I had remembered – she didn’t just say “those are fine”, she also added that although they were wide enough and dark enough, they were not quite as tall as she would have recommended, and she also recommended that I wear a hat. Something also changed in the relationship between us – I feel like I am now a bit more than just the customer or patient. It feels like we really are working as more of a team and that going through the recording process formed a slightly more equal relationship between us – one in which I play a contributing and guiding part, rather than just being a passive recipient of services. Of course this will only work in some clinical situations – when you are strapped to a spine board and being medevac’d to the nearest ER, smartphones and apps are not really much use. However, for a great many scheduled visits this would work well, and small emergencies with relatively low acuity, recording instructions could be very useful. For this purpose the app has a nice big red button, so you can instantly record a session without having set up an appointment previously. I think that having the app was a great help in planning the appointment, and it helped me to think through what I wanted to achieve and what answers I needed. Having the app handy meant that I didn’t forget to ask, as is normally the case, and the recording process didn’t hinder the doctor, and gave me an accurate record of what advice I was given. It also changed the way the doctor answered me, and the answers were more targeted and clear. Having a permanent, secure, and accessible record is very useful, and being able to share this and future records with my other providers is probably going to be useful.